Tubeteika is an ancient Tatar national man's headdress. Tubeteika (or түбәтәй) is small cap, put on the top part of a head. Atop of it often put on varied fur and fabric caps, hats or such headdresses as a turban. Tubeteikas were sewed from a soft matter, thus there was a special way of an attachment of a backing and top by fine stitches. The indispensability in such backing was defined by hygienic reasons, and besides it helped to hold the form. Thus there was a tradition between stitches to lay a horsehair. On Tubeteika often put the national patterns executed by beads, and sometimes and a gold embroidery. 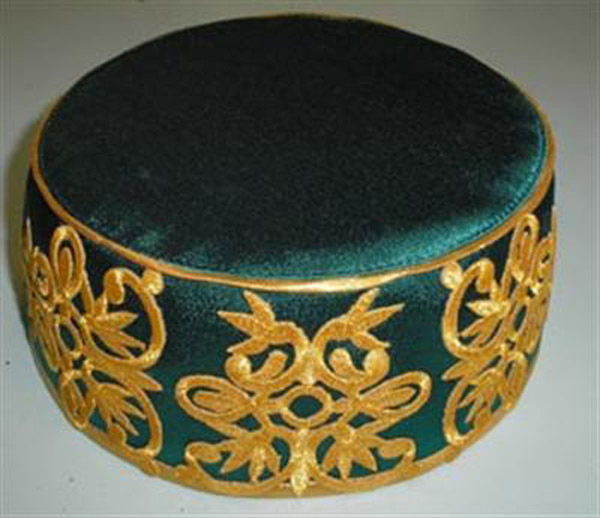 The some tubeteikas, especially from a velvet, were not decorated with anything additional. Differences in patterns defined age of the owner Tubeteika: young men preferred bright and multi-coloured embroideries, and more modest should be carried to old men. The most widespread type of tubeteika cut from 4 wedges. Such headdress possessed the hemispherical form. Hardly an arch the type later was recognized is a round basis tubeteikas and flat top. Such headdresses carried tatars in Kazan.